In our previous post, we discussed the types of Account which are: real, nominal and personal. 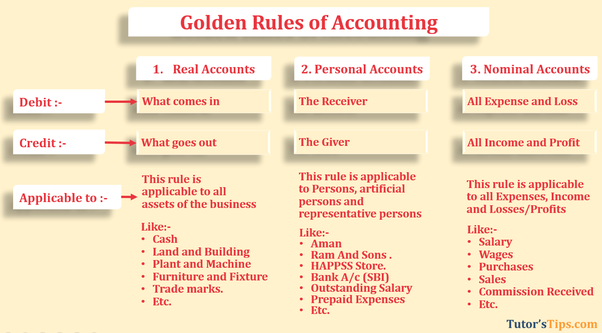 The golden rules of accounting makes it mandatory we first ascertain the type of account in question. The golden rules of accounting makes it possible for anyone to be a bookkeeper. They only need to understand the different types of accounts and then apply the rules diligently. This type of accounting rule is used in the case of personal accounts. Personal account includes individual account, debtors and creditors account, etc. When a person gives something to the business, it becomes an inflow and therefore the person must be credit in the books of accounts. The opposite of this is also true, which is why the receiver needs to be debited. This type of accounting rule is only applied in case of real accounts. Real accounts involve accounts for assets e.g machinery, land and building etc. By default, they have a debit balance. Therefore, when you debit what comes in, you are adding to the already existing account balance. This is specifically what needs to be done in the books of account. Similarly when you credit what goes out, you are reducing the account balance when a tangible asset goes out of the business. This accounting rule is applied when the account in question is a nominal account. Nominal accounts are account for expenses incurred, income received, loses and gains. The capital of the company is a liability, so it has a default credit balance. When all incomes and gains are credited, you increase the capital and by debiting expenses and losses, you decrease the capital. This is specifically what needed to be done for the system to stay in balance. Some Examples of this kind of transactions include cash/bank, Land and building and rent. Some examples of this kind of transactions are Vendor/Customer relations, debtors and creditors, etc. All gains and income are credit. All losses and expenses are debit. Some examples of this kind of transactions are sales and/or purchases.